Are we allowed to still talk about Alexis in here while he's out of the team or is this thread strictly about game performances ? Couldn't find a thread about him on the Manchester United forum. I was starting to forget he actually exists. Am I correct in thinking that he has only completed 90 minutes once (1) this season?! At least he always makes a few kids smile by stopping for a photo on the way into the ground to watch from the stands, but boy could we do with him finding some form. Woodward needs to put in some dirty work this summer to free up that no.7 shirt for Sancho. He has been terrible but I still dont understand why he doesn't play as a striker or on the right or as a 10. Maybe he is completely finished but he must still have his scoring and assisting instincts? We do know he cant play on the left. If he scores us the winner or plays a blinder that helps put us through, all is forgiven. I want him gone asap. He's disrupting the squad with his wages and taking up space. He's finished. Everyone claiming him as our main problem really are dumb. If anything our pathetic form in his absence has proved that he is not the reason for all of our ills but a convenient scapegoat. Starting to think this too. Although he is out of his depth wide left. He's not a main problem, but he is taking up room in the squad and not worth the wages we're paying him which has caused all kinds of problems in the squad. His end product has been woeful for us. A real shame he came to us at this point in his career. Scoreline is 1-0 to us going into injury times. We are just hanging on for life against Barcelona's onslaught. Lukaku blasted the ball upwards. Sanchez, who came in from the bench got it. Barcelona have pushed too far up and it's Sanchez against Ter Stegen alone. Gary Neville: "It's Sanchez! OOOOOHHHHHH! 400k/week have just been repaid!" Dont you think he would be better as second striker like Griezmann or Dybala? Or do you have faith in him as left winger/wide striker? Apparently he is the reason Martial was not playing so holding us back, accept when Martial has played in his absence he has been rubbish. Martial was playing well earlier in the season, and he was playing well when Sanchez was initially brought in and dropped for him. That Martial is out of form and not playing well these days does not in any way vindicate Sanchez. He’s still been an awful signing, is currently a useless player and we would have been much better without him. He won't play a single minute unless all is lost and OGS will just wanna give him a run. ... and Sanchez has won it! It’s time to pull your finger out Alexis. He just hasn’t convinced me in any position. I’d like to see him up front with Mata in behind, but I think they’d both still find a way to look average. That said, it’s better than them playing wide left and wide right respectively. Me neither, I'm saying I'd rather see him on the RW, than both Lingard and Mata, simply because they are awful. Someone posted Alexis stats this season, and he was better compared to both, key passes and chances created I think it was. He was very good vs Juventus away as the lone striker. But still think it has been a disaster signing and hope he is sold/released in the summer. All will be forgiven if he comes on and nets a late winner tonight. I’d rather see him there than Mata, for sure. Playing with Mata wide is like playing with 10 men. Lingard I’m unsure of. Every time I watch him, I’m convinced he’s playing terribly, that he does literally nothing and he never scores or assists, but then we seem to lose something when he isn’t there. He’s the most confusing player I can remember. Then again I wouldn’t be averse to seeing Sanchez start over him, purely because I don’t think he’d do any worse. Could be useful if someone gets injured or tires near the end. I can see him finding a way through against Spanish opposition. Actually said a while back I hope he can produce something against PSG or in later stages of the CL, otherwise he hasn't done much at all in all that time. I'd bet a lot of money that wont happen. As mentioned above, all will be forgiven if he scores the winner. Let's not kid ourselves though, he's shite. Oh, I'm not either really. I fully expect us to lose but I think it'll be a somewhat even game like the first leg. We won't be as bad because we will create more chances and probably score, but Barcelona will be better as well. The more likely scenario is we're drawing 1-1 or losing 2-1 when Sanchez comes on for the last 20 minutes and he does nothing. Albeit it we'd probably struggle to give him the ball enough anyway. 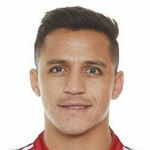 If Sanchez scores the winner, calculate how much we've spent on his wages thus far and find out how much more money we'd win for making it to the semi final. Subtract his wages from our winnings and we'll see if he's been worth it financially . Ole's comments suggest he's going to give Sanchez a private pep talk, throw him in tonight and hope that he earns every penny we've gifted him since he joined us. I sincerely hope this isn't the plan, because he'll obviously do nothing. He won't start this game. Probably will get subbed on for 20-30 minutes though. In truth, we could say this about almost everyone we've recently signed. I'd like to see our players in a more fluid and cohesive team. Currently, we're still playing trash football and a lot of players look woefully out of form.